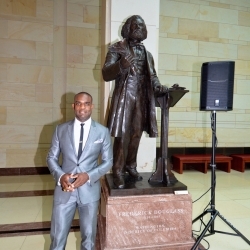 Following attendance at the historic 150th anniversary commemorating the 13th amendment, LEAP CEO, Dr. Clayton Lawrence hosted a table at the DC Chamber of Commerce’s Annual Meeting. Washington, DC, December 14, 2015 --(PR.com)-- Engaged hosts at the DC Chamber of Commerce’s Annual Meeting and Chairman’s Inaugural Breakfast, Lawrence Executive Alliance of Professionals (LEAP), LLC, places a great significance on supporting events such as these. The company hosted a table to include ten prominent D.C. business and community leaders for the affair. As an event that promotes excellence in leadership, via small businesses and non-profit organizations in the Washington D.C. community, this annual meeting brings together those with the common goal of making the greater D.C. area an even better and more sustainable place to live, work, and serve others. One of the primary focuses of the event was discussing how to further cultivate economic development throughout D.C. A strong emphasis was placed on ensuring that small business leaders are not only aware of the ways in which their specific businesses impact the economy, but that they are also actively engaged in long-term planning for future growth. However, even more importantly, this event focused on further building the strong sense of community among business leaders and among the citizens of Washington D.C. So many leaders in the community believe that one group cannot thrive, grow, and succeed without the other, and this event provided a forum for community members and leaders to come together to share ideas and innovative initiatives that will make a lasting, positive impact for the greatest number and greatest good. Dr. Lawrence, heard so many of those age-old ideas, promoting the greatest good for D.C. citizens and all of the nation’s citizens, on Wednesday, December 9th, when he had the opportunity to attend the historic ceremony commemorating the 150th anniversary of the 13th Amendment, which abolished slavery. President Barack Obama, senators, and representatives gave poignant speeches in honor of the occasion at Emancipation Hall in the Capitol.